Why do I need an Application Context? How do I tell TYPO3 what Context it runs in? How can I utilize the Application Context? Because you are a developer who is better save than sorry. You don't want to mess with the productive site because you "thought it was your local development system". You want to configure your system in a way that it behaves like you want in development as well as in production. What you don't want, is to change the settings on your local machine each time you synced with the productive database. You don't want to be in a position where you could forget to remove your private email address in that crucial application that you put there to test the email output before the next deployment. Btw: if you don't set a proper application context, TYPO3 will always assume that you are in Production context. And you don't want to be the person, that runs his/her local development systems in Production context, am I right? Still not convinced? OK, one last thing: It's fancy! This can also be done in a .htaccess file. Alternatively mod_rewrite could be used to set the environment variable depending on rewrite conditions. You can check if you did everything right by verifying your context in the application information of TYPO3 in the backend. Alternatively you could specify the context with every CLI command. That might be usefull if you run multiple systems in different contexts on the same server. So now that we know all this, let's move on. I'm glad you asked. First of all I want to point out that I feel most comfortable with only adapting configuration to the current context, not code. But that is only an opinion and there might very well be good reasons to use a context-switch in your applications domain logic. Additionally we include a configuration file if it can be found. In our example we will require the file Development.php in a folder called Configuration. 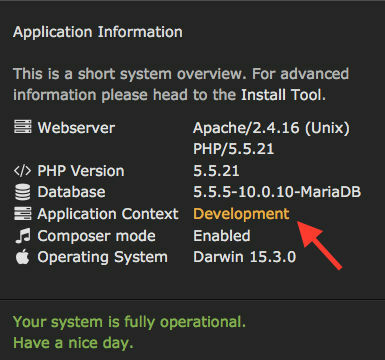 We now can put all the settings that we want on a development system into that file and it will only be loaded on systems with TYPO3_CONTEXT set to Development. We enable displaying of errors and enhanced logging as well as other stuff you want to turn off in production for security or performance reasons. We can also configure the database connection for TYPO3 in that file so we connect to our local database when developing. So much for the global configuration of TYPO3. But what about TypoScript configuration? Those may be even more important! With this knowledge you have full control over all extensions and the behavior of the core on every server at any time. As a last advice I'd try to always put the production configuration as a default in my files and only overwrite in other contexts where it is needed. Well, thats it. You should be fine now to make use of this little piece of best practise. Enjoy your context driven TYPO3 in the future!